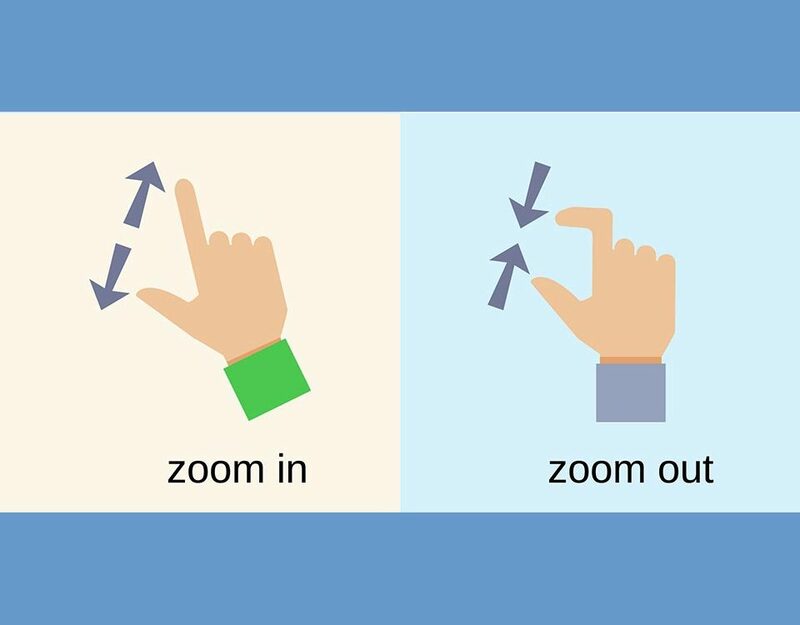 This tutorial shows you how to add image zooming to the Q for Android default theme, but the same method can be used for any other WP-AppKit theme. 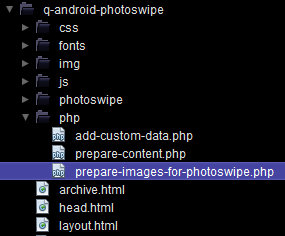 First, let’s make a copy of your current Q for Android theme folder (themes-wp-appkit/q-android) to themes-wp-appkit/q-android-photoswipe so that you always keep the original version of Q for Android theme in case of future updates. Finally in your app edition in WordPress Back Office, make sure you choose this new theme and save your app. PhotoSwipe source files can be downloaded from here. We then put them in a photoswipe folder at the root of our theme. 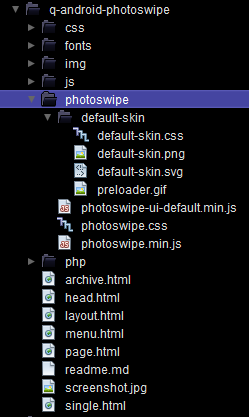 In this tutorial we use the minified versions of JS files: (photoswipe-ui-default.min.js and photoswipe.min.js). Images inserted in posts content are automatically resized by WordPress. So, by default, images sent to the app in web service are the resized versions. But when zooming an image in the app we want to display the full size version. That’s why we need to add the full size information (url, width and height) to images sent through the webservice. The following code should be put on top of your theme’s functions.js file (just after dependencies declarations). Note how we retrieve here ( $image.data( ‘full-img’ ) etc… ) the full size’s url, width and height that we previously set by modifying the webservice, so that PhotoSwipe can open the full size image. We fix that by only open the PhotoSwipe gallery for an image if we’re not “touchmoving” it. Hope you will add wonderful image zooming to your apps! For any question or feedback you can use the comments below. Note that what’s presented in this tutorial will only work for single images inserted in post content and won’t handle WordPress image galleries. See our next tutorial where we extend this code to handle WordPress native galleries with PhotoSwipe. thanks for this acurate tutorial. It’s a bit long to perform but doable. Just a question : couldn’t it be possible to include PhotoSwipe in an all-in-one ready theme in WP-AppKit package ? Hi Philippe, thanks for your feedback. Our theme library will grow, but for now we try to keep default themes as simple as possible so that special features can be added one by one when needed. A Q-Android theme with PhotoSwipe implemented can be found here. I still can’t make it work… I tried from version 0.6 of your extension and problem is the same on this one. Other point : I can’t see web version on mobile and https gives errors with required.js (make not because of the swipe). To answer to your previous post, i do not agree with you when you say we have to add special features when needed. They are standard features and are needed from start. Swipe, wordpress galleries, search box… even admob! Imagine that we have to follow you tutorials for several web sites X2 (android + iOS). I think you should update base theme with extension updates. Can you tell me what could cause this require.js problem? Sorry to hear it doesn’t work. You may open a ticket sending an email at support [at] uncategorized-creations.com. Please, send an email per issue with a meaningful subject. Otherwise your requests will be delayed. Regarding packaging more features (swipe, galleries, search box…) with starter themes, it’s a difficult topic. First, we won’t add specific features like AdMob in starter themes. The second thing is that we have to carefully invest our (free) time (between core developments, documentation and support notably). So at the moment, we won’t expand the starter themes unless we got more resources. Tutorials are a way to have documentation for common questions we have on support. We write them as soon as we have enough time for that. Of course, it is not optimal but that’s the way open source projects go. We have to balance daily life with the value delivered to the community. Tell me how to make the “share” button? It is very necessary, please! 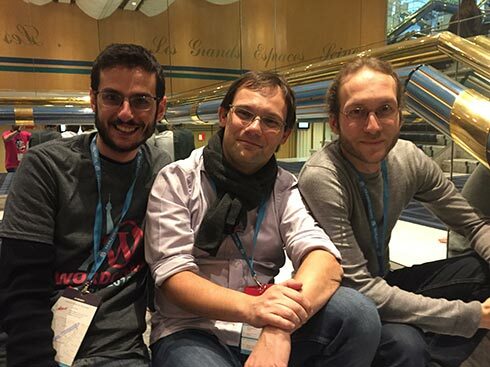 Hi Igor, you can reach us at support [at] uncategorized-creations.com. We’ll write shortly a tutorial about that topic.